If someone were to ask me to name the most widely seen movies ever made, not just based on box office figures but on TV and DVD, I’d probably put only Star Wars and The Wizard of Oz on top of that list with a lot of space between those films and the next one down. Both movies transcend time and are invisible to their age. Like Gone with the Wind, The Wizard of Oz is a producer’s picture, not a director’s picture. In fact, there were four directors, all of whom left or got fired for one reason or another. This includes the only credited man, Victor Fleming, who would also go on to direct portions of Selnick’s picture and get sole credit as well. The opening Kansas sequence, shot famously in black & white and timed for sepia tone, evokes a cinematic period before 1939. By 1939, black & white was so sophisticated, cinematographers could manipulate light and shadows to do anything. So the sepia tone and the obviously stagey studio set opening are meant to bring us back to a simpler time even before the relatively simple times of 1939 cinema. Perhaps the anachronistic opening was meant to enhance the great transition to Technicolor, which announces itself so grandly when Dorothy exits her tornado-transported home and enters Munchkinland. Rare for its time, Oz seems to have an awareness of itself. As a strictly studio picture, The Wizard of Oz is not much more than a theatrically staged telling of the Frank L. Baum story. Some might describe the choreography as stagey, as there’s an awareness of the interior studio setting at all times. The painted backdrops looks like, well, painted backdrops. The flowers look fake. The colours are overly saturated and unrealistic. The edges and falseness in the costumes and makeup worn by the Scarecrow, Tin Man and Lion are made visible by the bright, unsympathetic lighting. Like the front row patrons of a Broadway show, there's very little hidden from the audience in Oz. Even within the constraints of the studio, iconic imagery is everywhere. The mere sight of Dorothy and her three costumed companions skipping down the yellow brick road toward the Emerald City is as grand a composition as there ever was in movies. The foursome framed at the bottom of the screen, with the converging lines of the road creating the sense of depth and the deco design of the castle at the top of the frame is a brilliantly fantastical work of art. 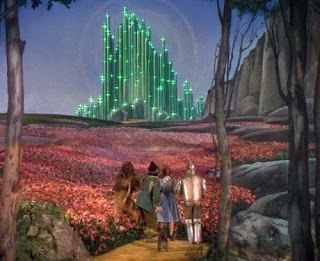 The Wizard of Oz is a work of pure and inspiring fantasy. The classical structure of the fairytale hits every beat so precisely, in hindsight it’s a template for all fantasy cinema made after it. Dorothy’s journey is not unlike Frodo’s in Lord of the Rings or Alice's in Alice in Wonderland. She’s so innocent, fragile and dainty in her pretty dress accompanied by her constant follower, Toto. Even her empty basket, which she refuses to put down even in the most dangerous of situations, remains on her arm. Dorothy, as a farm girl, doesn’t know it, but her congeniality and resourcefulness is about to save the world from the tyranny of the wicked witches. Well, Glinda knows it. We can see it on her face when she first introduces herself in Munchkinland that Dorothy will be the saviour. The late second act action sequence in the Wicked Witch’s castle is frightening. It’s not just Margaret Hamilton’s snarling performance as the Witch, but also her army of Russian Army-coat wearing minions and flying demon monkeys. The grey and gothic tones of these scenes provoke a truly dark and threatening hazard in Dorothy’s journey. My favourite performance, no doubt, is Bert Lahr as the Lion – a character of vaudevillian extremes with an exaggerated New York accent, which, out of Dorothy’s three sidekicks, best represents the trio’s slapstick comedy. The Wizard of Oz is invisible to its age because if the film were made now – or perhaps before the age of CG – under a producer as smart as Mervyn LeRoy it would likely (or should) look exactly the same. Look at the 1971 version of Willy Wonka and the Chocolate Factory for instance. That film was made 32 years after Oz, but it has the same visual and tonal sensibilities. It’s no wonder that film is also a timeless classic. The Wizard of Oz is available on Blu-ray from Warner Bros. Home Video. Well said, but I submit all films are producer films.